Mahogany bedroom furniture makes an impression, especially when handcrafted with care and precision, like our Crowley Sleigh Bed. This mahogany sleigh bed features shop-sawn ribbon mahogany veneers that were slip matched and shaped using a bent lamination. Oil/varnish and wax finish. 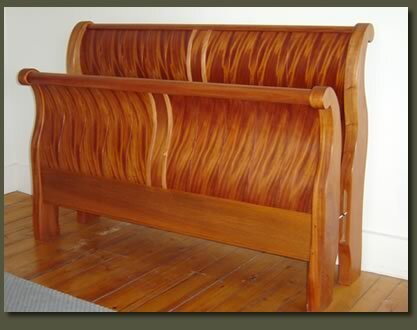 ""I own several Clarner Woodworks furniture creations, and each receives the unsolicited attention of my houseguests. The pieces are uniquely designed and carefully constructed from the finest hardwoods to last for the ages. They truly are works of art that will become family heirlooms." Custom made mahogany bedroom furniture makes a unique and striking addition to home decor. The mahogany bedroom sets constructed by Clarner Woodworks are handmade with the highest level of craftsmanship. Only the finest woods are chosen, resulting in furniture pieces that are durable and solid. Wood furniture has a timeless appeal, and a custom built mahogany sleigh bed from Clarner Woodworks will be cherished for generations. Mahogany is an exotic reddish-brown wood desired for its rarity, strength, and beauty. It has a fine grain, is very durable, and resists swelling and warping, making it ideal for areas with high humidity and moisture. Ribbon Mahogany is a rare and unique type of mahogany with distinctive figure in the wood which resembles swirling ribbons. Like all Mahogany, is it strong, has a fine grain, and resists swelling and warping, making it a perfect wood choice for constructing a highly decorative and unique bedroom set. 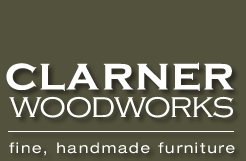 Clarner Woodworks will work with you to design the bedroom furniture that best meets your needs. Whether you are looking for a piece of funiture to match an existing set or wish to dream up something completely new and unique, Clarner Woodworks will guide you through the custom furniture building process and create bedroom furniture that is sure to delight you. Our solid wood bedroom furniture will make a welcome addition to your home.